The 104th regular meeting was held on Saturday, 18 June. The mini practice report was done by Morozumi Keiko (Saitama Prefectural Tokorozawa-kita High School). 30 students visit a sister school in New Zealand every summer and go to the elementary school there to introduce Japanese culture. The other report was about her English class. As an introductory activity, students learned about the background of the Holocaust with the jigsaw method. 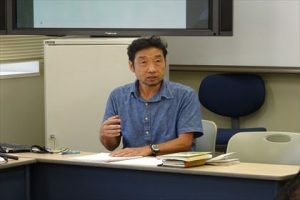 Following the mini practice report, for the coming summer seminar on August 7 (Sunday), the members in charge of each workshop talked about their plan and we exchanged opinions. The contents of the workshop will also be introduced on our website as soon as they have been determined. 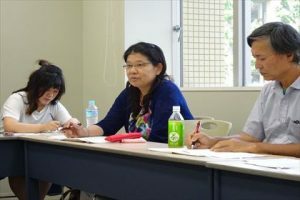 For the more practical report, Fujimaki Akira (Megurogakuin High School) talked about social studies classes, which take advantage of active learning. 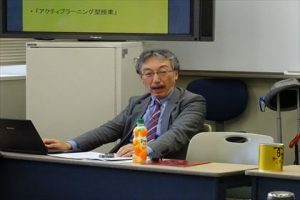 Miyazaki Michiharu (Toho Elementary School) reported on “classroom management and child guidance in elementary schools.” Both reports included a video of the class using the technique of ‘acquisition-oriented’ learning. This entry was posted in Regular Meetings on 18/06/2016 by staff.